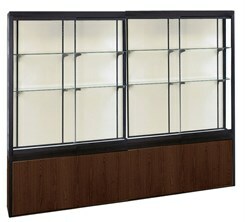 Home / Reception Room / Display Cases / 66"H Platform Display Cases Up To 12' Wide! 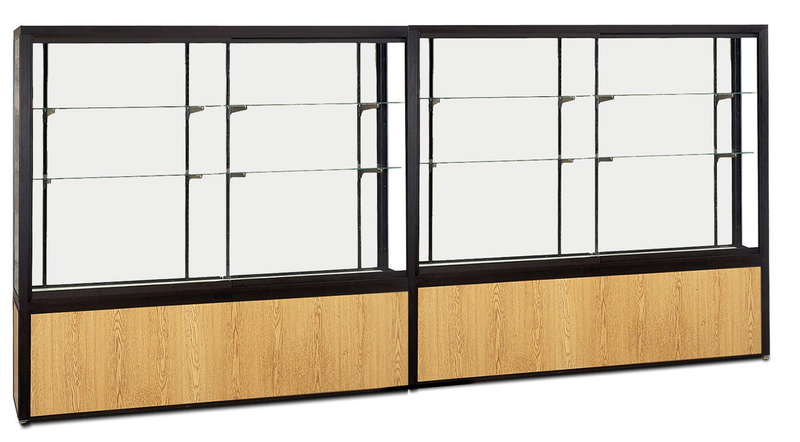 If you need a trophy case that will stand up to the rigors of a busy hallway, a crowded entrance way or an industrial break room, you need the heavy-duty construction of our Platform Display Case Series. 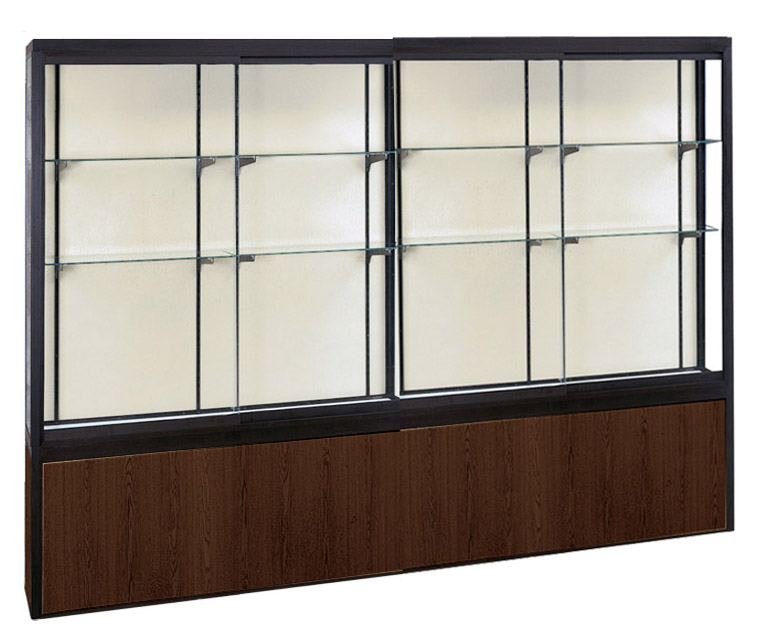 Built tough, Platform Series cases are fabricated with anodized aluminum extrusions, steel shelving hardware, 1/4" plate glass shelves, and sliding tempered glass doors with ground in finger pulls and built-in locks for durable performance. 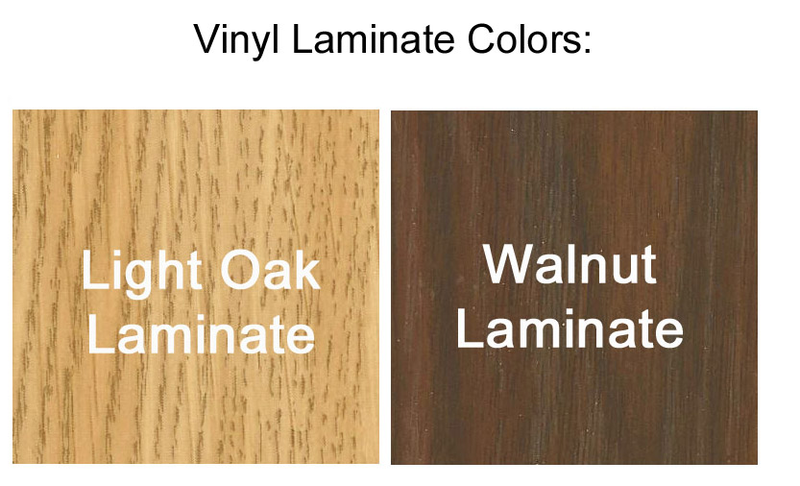 18" high platforms are tough, scuff-resistant vinyl laminate in choice of Light Oak or Walnut with aluminum framework. Available in lengths from 48" up to a roomy 144". 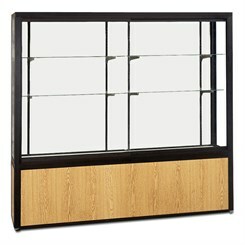 48", 60" and 72" wide models have two sliding doors and four support legs. 96", 120" and 144" wide models have four sliding doors and six support legs. 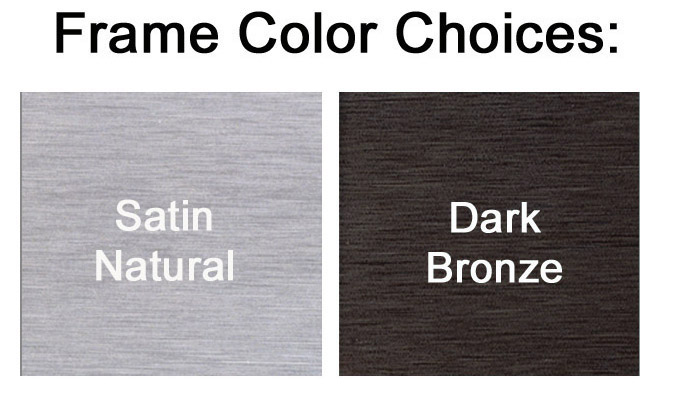 Choice of two aluminum frame finishes and interior background in choice of cork, tackable fabric plaque material with velcro tape or white laminate. The Platform Series is the heavy duty case made to withstand real world conditions. The 48" wide model is sold above. 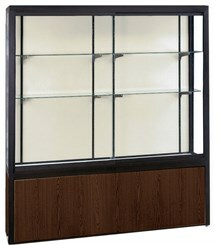 Includes six 12" deep half-length shelves. Measures 48"W x 16"D x 66"H overall. Ships fully assembled. Shipping weight 342 lbs. PRICE INCLUDES SHIPPING! (Truck shipment - see Terms & Conditions). Please allow 3-4 weeks for delivery. 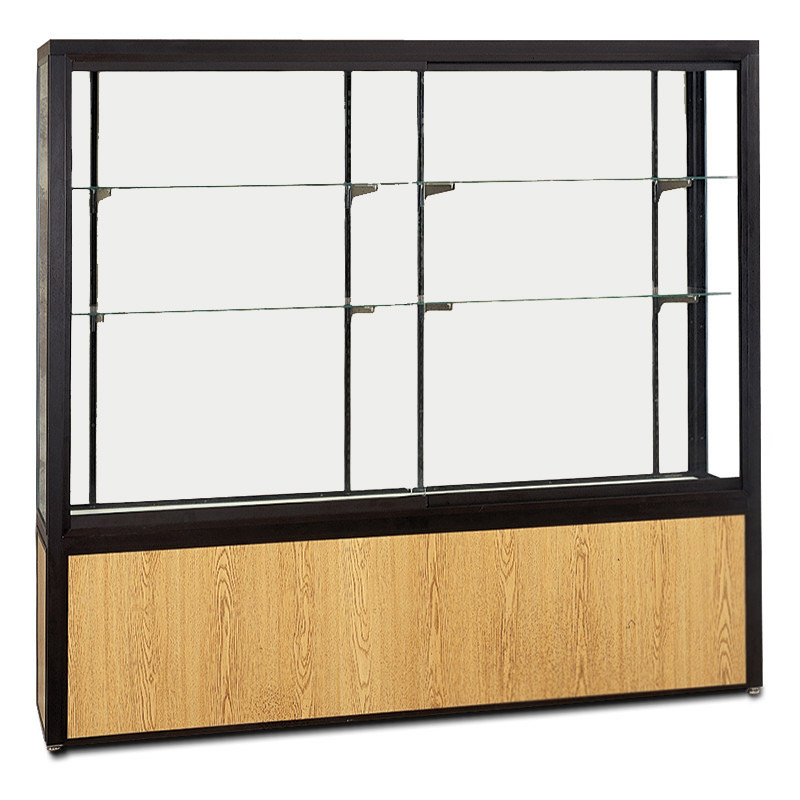 60"W Platform Display case features a resilient aluminium frame, tempered glass, laminate pedestal and includes six, 12"D adjustable shelves. Front sliding glass doors with finger pulls and built-in lock. Ships fully assembled. Measures 60"W x 16"D x 66'H overall. Shipping weight 399 lbs. PRICE INCLUDES SHIPPING! (Truck shipment - see Terms & Conditions). 72"W Platform Display case features a resilient aluminium frame, tempered glass, laminate pedestal and includes six, 12"D adjustable shelves. Front sliding glass doors with finger pulls and built-in lock. Ships fully assembled. Measures 72"W x 16"D x 66'H overall. Shipping weight 453 lbs. PRICE INCLUDES SHIPPING! (Truck shipment - see Terms & Conditions). 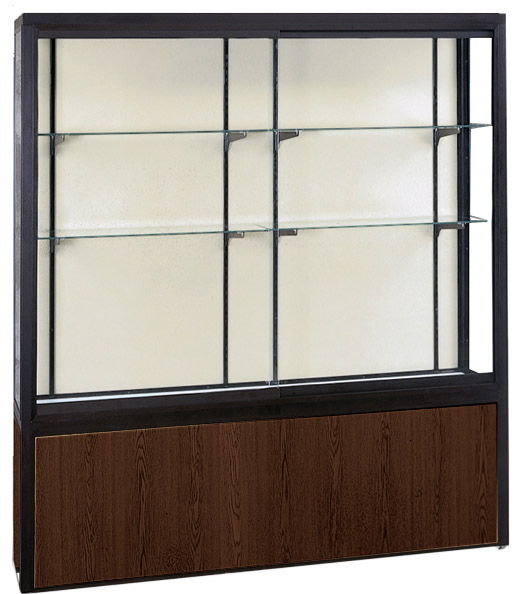 96"W Platform Display case features a resilient aluminium frame, tempered glass, laminate pedestal and includes twelve, 12"D adjustable shelves. Front sliding glass doors with finger pulls and built-in lock. Measures 96"W x 16"D x 66'H overall. Ships assembled. Shipping weight 670 lbs. PRICE INCLUDES SHIPPING! (Truck shipment - see Terms & Conditions). 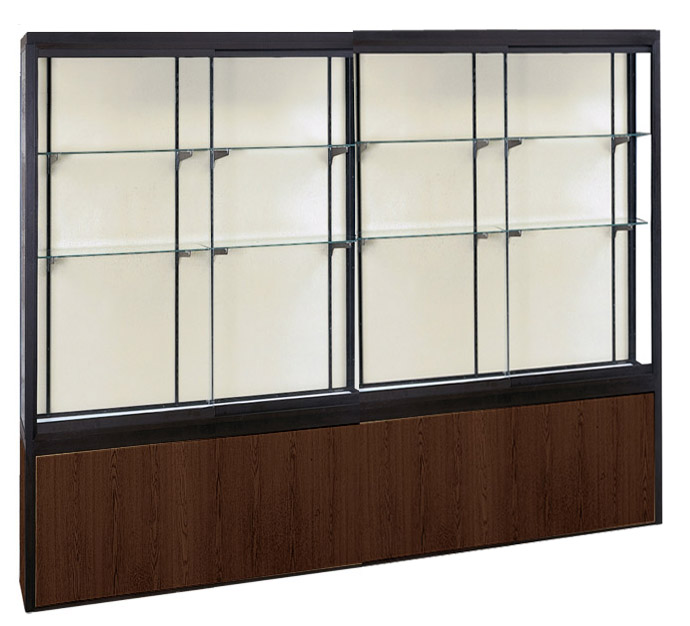 120"W Platform Display case features a resilient aluminium frame, tempered glass, laminate pedestal and includes twelve, 12"D adjustable shelves. Front sliding glass doors with finger pulls and built-in lock. Measures 120"W x 16"D x 66'H overall. Ships assembled. Shipping weight 820 lbs. PRICE INCLUDES SHIPPING! (Truck shipment - see Terms & Conditions). 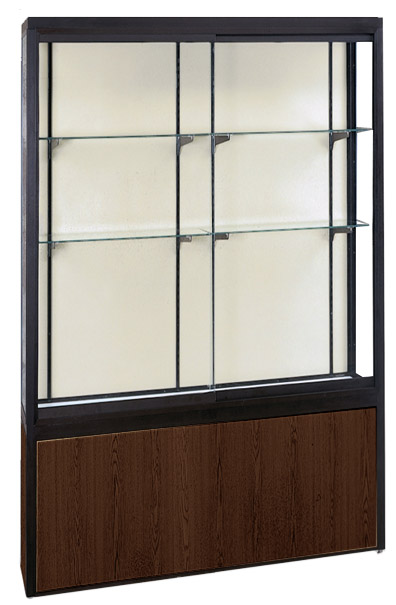 144"W Platform Display case features a resilient aluminium frame, tempered glass, laminate pedestal and includes twelve, 12"D adjustable shelves. Front sliding glass doors with finger pulls and built-in lock. Measures 144"W x 16"D x 66'H overall. Ships assembled. Shipping weight 960 lbs. PRICE INCLUDES SHIPPING! (Truck shipment - see Terms & Conditions).